Food is your primary source of nourishment and health. What you put into your body matters. The quest to eat healthy seems like it should be so simple, yet there is so much deception from food companies that it is hard to know what is healthy and what isn’t. As you walk through the aisle of your local grocery, you are inundated with thousands of subtle marketing ploys. Food companies want you to buy their products, and actively strive to mislead you into thinking that their food is healthier than it is. You see products that boldly announce things like ‘Organic’, ‘No Trans Fats’, ‘All Natural’, ‘Gluten Free’, ‘Fat Free’ and so many other seemingly healthy terms. 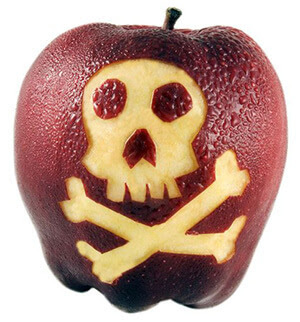 Consumers often don’t realize that they are buying foods that are harmful to their health. You might think, “it’s organic, so it must be healthy.” Unfortunately, that is not always the case. The sooner you realize this the better. Food companies are not interested in your health. They are interested in making money. Companies shift their marketing to meet consumer trends and demands, but they will not necessarily change much in how they process and manufacture food. They will also go out of their way to hide unhealthy ingredients from you. What’s worse is the FDA allows this. They also allow numerous food additives that are known to create major health problems. You want to know something else crazy? The FDA also doesn’t require chemical contaminants (like rocket fuel) to be listed. There are soooo many unsafe food additives whose names are misleading to the uninformed consumer. Knowing this, the grocery store suddenly becomes a landmine rather than a source of nourishment and health. You don’t know what you are putting into your body or feeding your family. It’s no wonder there are so many major health problems in this country. Even if you shop in the organic/natural/whole foods section of your local grocery, you still have to be careful. Certainly, there are many better choices there, but these sections also have a lot of highly processed foods that are not as healthy as you might think. You need to be very careful about ANY packaged foods you purchase. Read your labels carefully. Sodium Nitrate is an additive used as a preservative. It is found in deli meats, hot dogs, bacon and other processed meats. Studies have linked sodium nitrate to heart disease, diabetes, cancer, neurological conditions, and gastrointestinal problems. If you eat meat, stick to lean fresh meats and limit or steer clear of meats containing sodium nitrate. Azodicarbonamide is an industrial chemical that is used to make rubber and synthetic leather. It makes things foamy, so somewhere along the way, someone thought it was a good idea to add it to bread to make is spongy! It is also used to whiten cereal flour. While the FDA claims that there is insufficient research to determine harm from exposure to this chemical in food, it has been banned in Europe and Australia. The World Health Organization and the CDC list respiratory issues, and skin and eye irritation warnings, and say not to ingest. Other sources associate ingesting this chemical with damaging hormone and immune function. Despite to corn industries aggressive campaign to convince us otherwise, high fructose corn syrup is NOT a natural food – it is highly processed. It is also not the same a natural sugar and it is not processed by the body in the same manner. Given that, coupled with the high quantities of high fructose corn syrup hidden in our food, it creates numerous health risks.High fructose corn syrup is linked to obesity, type II diabetes, high blood pressure, liver disease, and heart disease. Food manufacturers know consumers are looking for it on ingredient labels, so many now list it as fructose or fructose syrup. It’s the same dangerous ingredient, same high quantities, just a deceptive new name. Butyl hydroxytoluene (BHT) is a synthetic compound used as a preservative in foods and cosmetics. It slows the natural oxidation process, keeping foods and cosmetics from going bad. Interestingly, if you read the MSDS (Materia Safety Data Sheet) for this chemical, it clearly identifies it as a toxic substance. But it is in our food! Studies have linked BHT to cancer in animals. “They” say that low doses are fine, whereas high doses are not, however BHT is in a ton of food products, so how do you determine high vs. low doses? And is there a cumulative effect? Essentially, enriched flour is flour that has been chemically and mechanically stripped of all its fiber and nutrients, and then has a small fraction of those nutrients artificially replaced. This leaves you with a product with virtually no nutritional value whatsoever. Due to the highly processed and depleted state, foods made with enriched flour are not processed in the same manner by your body. They immediately change into sugar and cause blood sugar and insulin spikes. This leads to numerous health risks, including increased risk for type 2 diabetes, damage to blood vessels, high blood pressure and increased risk for certain cancers. You may be accustomed to the texture and taste of white breads and flours, but do your health a favor and switch it up to true whole grains. The soybean has commonly been viewed as a healthy food and is a popular replacement for animal protein. Unfortunately, the soybean and soybean oil are also linked to many health conditions. One major problem is that the bean is commonly mass produced with lots of carcinogenic pesticides and genetically modified. Soy and soybean oil are linked to inflammation, digestive issues, allergies, malabsorption of nutrients and protein. The oil is also partially hydrogenated, thus a trans-fat, which you know poses numerous health risks. If you choose soy, be sure to find non-GMO, organic soy. MSG is a flavor enhancer that is added to many foods in the US. Unless you have been living under a rock for the past few decades, you have heard that MSG is bad for your health. It is linked to obesity, headaches, eye damage, nausea and other health problems. There are conflicting studies about short and long-term effects of MSG, however sensitivities are very common. With all the unknowns and the evidence toward health risks, you’re better of eliminating it from your diet. Yellow #5 is a food additive included in many foods to give it a yellow coloring. Studies have linked this additive to a number of health considerations. These include allergic reactions, hyperactivity, low sperm count, and cancer risks. Pay attention to this and other food coloring additives as many of them are linked to health concerns. Propylene glycol is a commonly used additive to foods, also a primary ingredient to antifreeze. Research studies around this food additive have produced inconsistent findings related to health risks. Some studies have shown risks associated with neurological issues, kidney and liver disease, and respiratory and cardiovascular disease. Due to the conflicting studies, there is no conclusive evidence, however is it really worth taking the risk while the researchers figure it out? Polysorbate 60 is commonly used as a thickener in foods and cosmetics. While there is not a lot of information available on this chemical compound, its ingredients are linked to carcinogens and fertility issues. The scary thing is that the above list is just a few of the numerous risky chemicals and compounds found in packaged foods. The only way to get truly healthy is to avoid these harmful additives and know what you are putting into your (and your families) bodies. One of the most effective ways to avoid these foods is to focus on whole foods. Buy fresh fruits and vegetables, and unprocessed meats and fish if you are an omnivore. Adding green smoothies to your diet is also an amazing way to start eating lots of healthy, whole fruits and vegetables without worrying about the taste. Not only that, but the nutrients in green smoothies can help reverse any damagae that has already been caused by these hidden chemicals. Smoothies are quick and easy to make, inexpensive and portable. They are a great solution for healthy eating overall and on the go. Watch my FREE presentation below to learn how people all over the world are losing weight, dramatically improving their health and feeling better than they ever thought possibleusing this simple information.